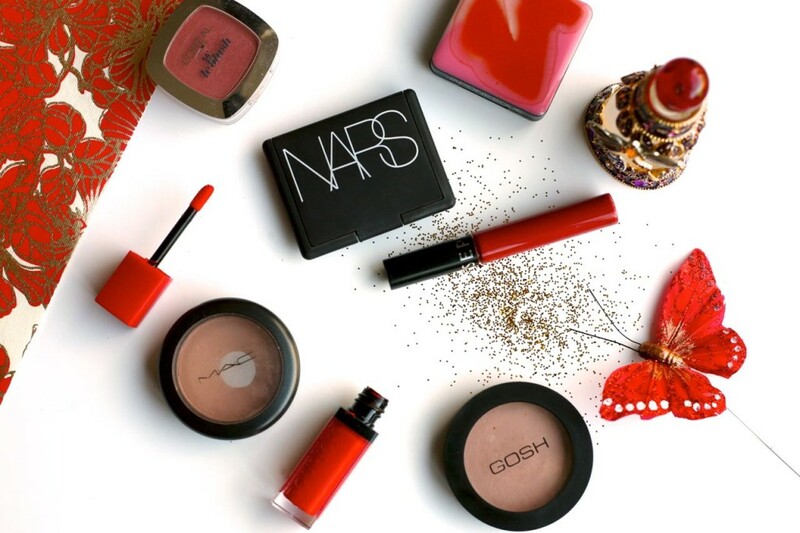 There’s nothing like a red lip, whether you go for a full on blood-red, a sheer wash of colour or the coral kind, but one thing that has always been difficult for me to get right is what type of blusher wear with it. If you go for a very bright blusher there’ll be a major clash situation going on and if you go too light or nothing at all, you end up looking really washed out with nothing but a bold lip on show….oh the dilemma! Everyone will have their own take on it and of course a lot will depend on the type of red you are wearing on the lips, your skin tone and overall makeup up look, but I think I’ve finally managed to find 5 blushers in my collection that I can rock a red lip with. All of them have a range of different finishes and come at different price points so hopefully there should be something to suit all. Going clockwise, first there’s the Nars Blush in Madly at £23 (sorry this appears to be out of stock, check again later). This works with any type of red and is described as a warm seashell pink (I’m wearing this in my profile picture). It’s buildable and although it has a shimmer, this is subtle once applied on the face. The Japonesque Velvet Touch Blush in shade 02 at £18 is on the soft pink side. Again, this also has a shimmer but with this one it is more noticeable if you overdo it. I only tend to wear this with a sheer red as I don’t like the idea of too much shimmer with a very bold lip. L’Oreal True Match Blush in Rosewood at £7.69 is the deepest of the 5 with a dark peach tone. It leaves a pearly sheen on the skin and I prefer to use it with a very light hand and with a sheer or softer red on the lips. Mac Powder Blush in Buff at £18 is a matte blusher and although it looks like it’s nothing to get excited about in the pan, this muted pinkish peach colour looks good with any type of red. Lastly there’s the GOSH Natural Blusher in Rose Whisper at £5.99. This is another matte blusher and is the lightest of the 5. I like this one for when I am wearing a very intense or deep red on the lips as it leaves a very subtle wash of colour that you can build up if you need to. So, if there’s one thing I’ve learnt it’s that you want to go for a healthy, but oh so subtle looking flush when you are donning a red lip and I think these blushers deliver just that. 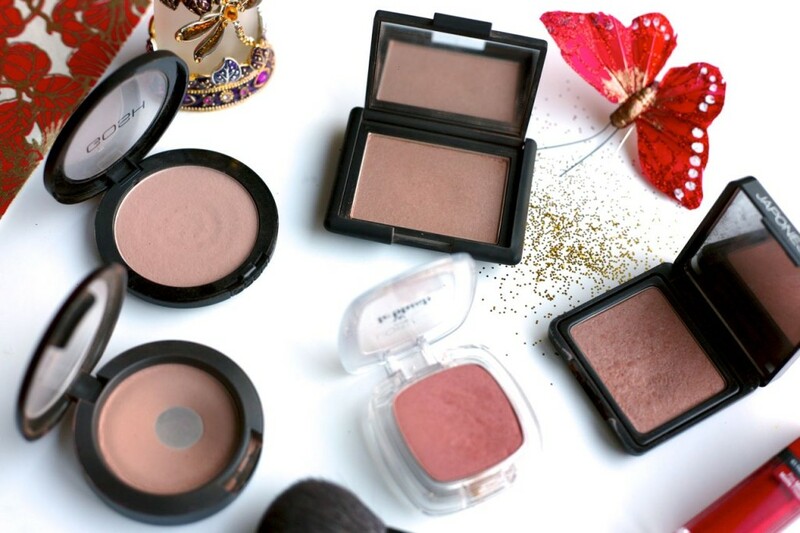 I also think you can use these blushers for any kind of makeup look, bold lip or not but just remember to always wipe of any excess blusher on a tissue or the back of your hand before applying it and build it up slowly….I’ve learnt the hard way! If there are any other blushers you think go well with a red lip drop me a note in the comments below, I’d love to know.